What Do These Images Tell Us? The Crab Nebula consists of a pulsar, a rapidly rotating neutron star at the center, surrounded by a bright diffuse nebula. The nebula, which is about six light years across, is expanding outward at 3 million miles per hour. The filamentary system visible in the optical images is near the outer boundary of this expansion. Both the nebula and the pulsar are bright sources of radiation in all wavelengths. The radiation we observe from the Crab Nebula is produced mainly by high-energy particles accelerated by the neutron star. These energetic particles, which near the neutron star are thought to include anti-matter positrons as well as electrons, spiral around magnetic field lines in the nebula and give off radiation by the "synchrotron" process. 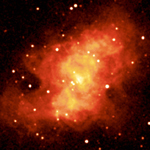 Comparing the X-ray, optical, infrared, and radio images of the Crab shows that the nebula appears most compact in X-rays and largest in the radio. 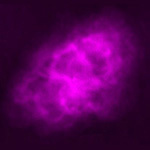 The X-ray nebula shown in the Chandra image is about 40% as large as the optical nebula, which is in turn about 80% as large as the radio image. This can be understood by following the history of energetic electrons produced by the neutron star. Electrons with very high energies radiate mostly X-rays. 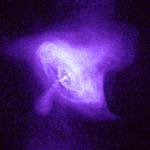 Chandra's X-ray image of the Crab Nebula directly traces the most energetic particles being produced by the pulsar. This amazing image reveals an unprecedented level of detail about the highly energetic particle winds and will allow scientists to probe deep into the dynamics of this cosmic powerhouse. As time goes on, and the electrons move outward, they lose energy to radiation. The diffuse optical light comes from intermediate energy particles produced by the pulsar. The optical light from the filaments is due to hot gas at temperatures of tens of thousands of degrees. The infrared radiation comes from electrons with energies lower than those producing the optical light. Additional infrared radiation comes from dust grains mixed in with the hot gas in the filaments. Radio waves come from the lowest energy electrons. They can travel the greatest distance and define the full extent of the nebula. 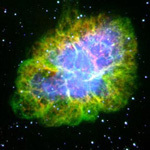 The Crab's central pulsar was discovered in 1968 by radio astronomers. The pulsar was then identified as a source of periodic optical and X-ray radiation. The periodic flashes of radiation are caused by a beam from the rapidly rotating neutron star.